Hartland is a village in Waukesha County, Wisconsin, along the Bark River, and is a suburb of Milwaukee. The population was estimated at 8,689 in 2006. You might say that the seed from which Hartland grew was planted in Ann Arbor, Michigan. Sometime in the fall of 1837, Stephen, the oldest of 13 children of the Sylvanus Warren family of Ann Arbor decided to move west and walked to Fort Dearborn (Chicago). He worked there and saved money for his journey and in February of 1838, he walked to Milwaukee and ultimately to Prairieville (Waukesha). In 1839 he bought 165 acres of land between Maple and Cottonwood Avenues (Hartland). Later he obtained probably another 80 acres east of Maple Avenue and became Hartland’s first real estate man, settler and builder. Other pioneers began farming the fertile Bark River Valley around 1837 and the village was known as Warren. Later, in 1842, a grist mill was built by Christian Hershey and the village was renamed Hersheyville. Even in those early days Hartland was a popular recreational site. A race track with a baseball diamond in its center was built in 1845. After horse races, the ball games between Hartland and neighboring towns drew as many as 10,000 people. Inns and resorts sprang up when the Watertown Plank Road (literally made from 10′ log planks) was built in 1846. The first Post Office was opened that same year with William Clark as Postmaster. After the railroad came in 1854 the village was given the name it still holds – Hartland, after the Indian word “Shabaquanake”. generally disseminated until Sunday. Several soldiers are buried in area cemeteries. In 1886, Hartland saw it’s first local paper, The Hartland Index. It changed names and hands several times but continues to this day as The Lake Country Reporter. 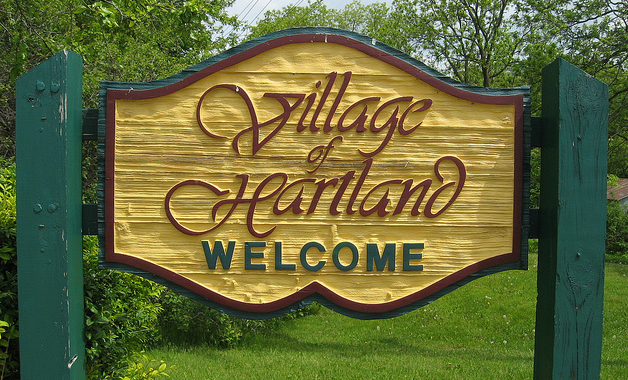 Hartland was incorporated as a village in 1892. Until this time, the village had been divided between the townships of Merton and Delafield. An election was held on 892, and a descendant of the original founding family, M.H. Warren was elected the first Village President. With roads, mills, stables, inns and a railway nested inside fertile farmland, Hartland developed into the village we know today.